Gear up New England, It’s going to be a cold weekend and we have a major football game on Sunday! Not sure what you’re all doing, but the Varitek home will be full of family and friends as we cheer on our beloved Patriots. I plan on over cooking as I always do, so I decided to update and share this crock of love with you all. This spicy turkey chili was the first meal I prepared using a crockpot. Technically, I’m still using the stove top to fully cook the turkey before tossing it into the crockpot, and I would suggest you doing the same. You truly don’t want to take chances while preparing raw poultry products. Here are some grocery store tips that will help while shopping for this recipe. I’m not a fan of canned anything, never have been. This recipe is an exception because I don’t feel like soaking beans all day (as you may typically have to) and this chili is meant to be simple in preparation. 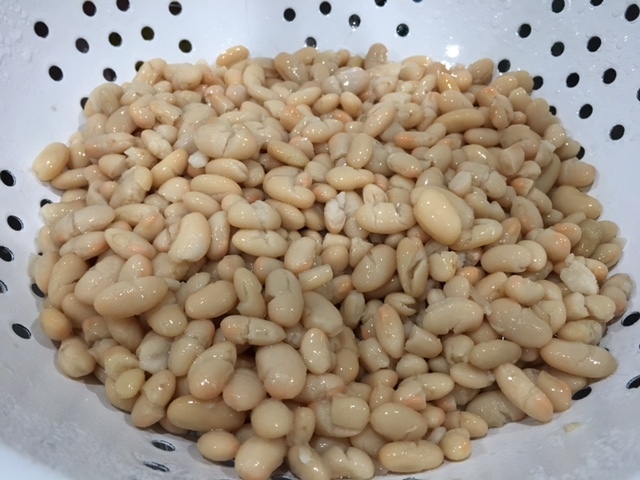 Keep in mind, the brand of the “canned” products will make a difference with this recipe as you want the beans to hold their shape and texture. I have tested a few store brands, because the were less expensive, and was left disappointed. The same holds true for the canned chiles, as you don’t want to be left with bland flavor or little heat in this dish. I really enjoy cooking with http://Bushbeans.com. I use both the Great Northern beans and the Cannellini beans. They both stay firm during the cooking process and use no additional additives. The La Preferida chiles are packed with flavor. They’re the real deal when selecting canned chiles. Keep in mind, they’re surprisingly hot even though marked as mild. http://www.lapreferida.com If you can’t find then in your local grocery store, try a more common brand like Old Elpaso https://www.oldelpaso.com. 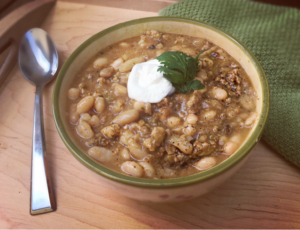 Did I mention this chili is free of gluten and packed with about 25 grams of protein in one serving cup? Amazing, right? Clearly, that can easily change when adding sour cream, shredded cheddar cheese, and other favorite chili toppings. Hope all this information overload helped. One warm and spicy bite of this chili and I sure you’ll agree, it was worth it. Optional: A quick roux mixture can be used if you like the chili extra thick. Set the crockpot on high for 4 hours. Open all cans of beans and empty them in a colander and gently rinse under cool running water. Strain the beans of water and pour them in the crock pot. To prepare the sausage links you’ll need a sharp knife or kitchen shears. 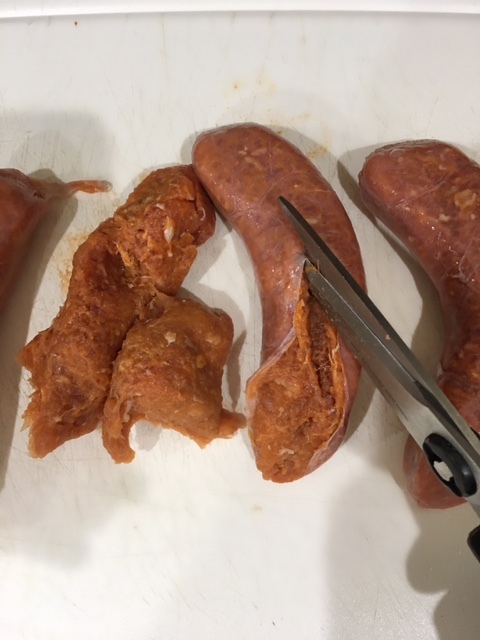 Cut the casing down the length of the sausage. Using your thumb and forefinger, grab a corner of the casing and peel it off exposing the meat. Discard the casing, and set aside the meat. You just won the sausage war! Heat the olive oil in a large skillet over medium-high heat. Add the onions and a pinch of salt, and cook until translucent for about 2 minutes. Add the garlic, fresh jalapeño, and stir occasionally with a wooden for another minute. 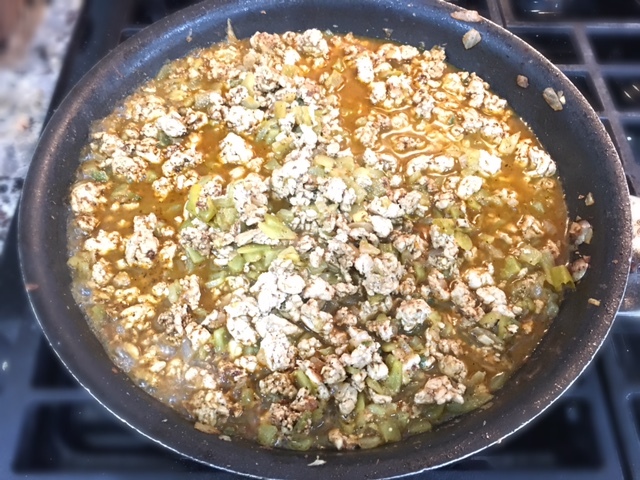 Add both the ground turkey and sausage to the onion mixture. Use the back of the wooden spoon, separate the turkey into clumps while cooking it through until there is no pink about 4 to 5 minutes. Stir in the cumin, oregano, garlic powder, and chili powder. Fold in the canned chiles. Add 1 cup of chicken broth to the mixture and gently stir everything one last time. For this step, please use oven mitts to prevent you from getting burned, as this may splash. Empty the entire skillet with the turkey mixture into the crockpot. Add the chopped cilantro, and pour in the last 2 cups of chicken broth. 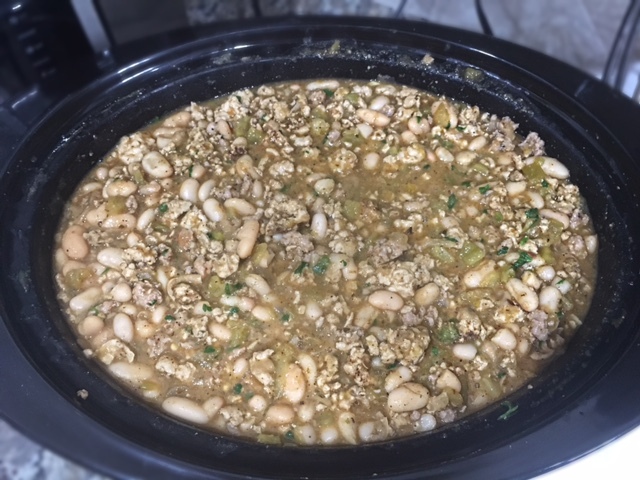 Use the wooden spoon to gently stir the mixture from the bottom of the crockpot to fold in all the beans and meat together. Cover and heat for 4 hours. Optional: For a more thick and creamy chili: Heat a skillet over medium high heat. Add 2 tablespoons of butter with 2 tablespoons of flours and whisk continuously for 2 to 3 minutes. Add 1/4 chicken broth and continuously whisk again for another minute. 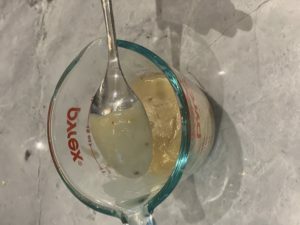 Mixture will be ready when it appears smooth and silky and easily coats the back of a spoon. Once ready, gently stir into the chili. A healthy and hearty chili loaded with ground turkey meat, spicy chiles, and protein packed beans. Rinse beans under cool running water, drain and place into crockpot set on High for 4 hours. Place a large skillet over medium-high heat. Add olive oil. 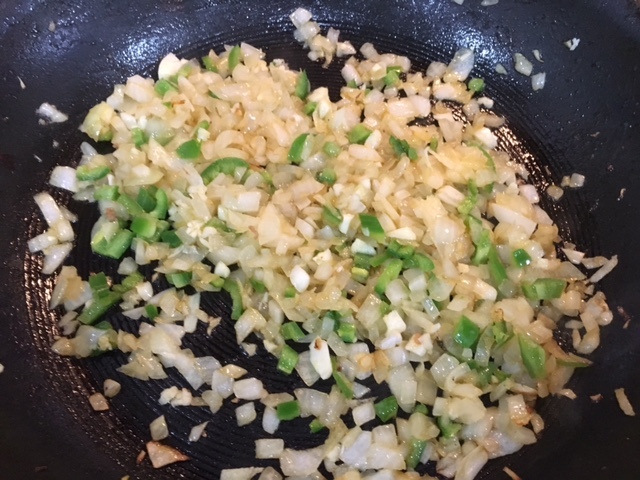 Once warm, add the onions and sprinkle with salt. Cook until translucent, about 2 minutes. Add the minced garlic, chopped jalapeño and cook for another minute. 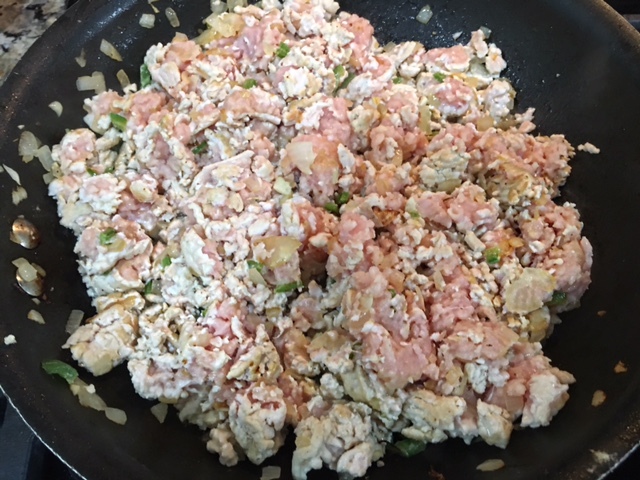 Add ground turkey and sausage to the onion mixture. Use a wooden spoon to help separate the turkey into clumps while cooking it through until there is no pink. Stir in the cumin, oregano, garlic powder, and chili powder. 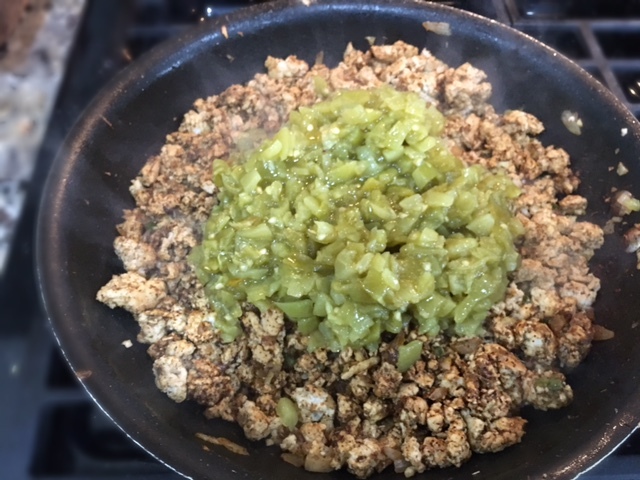 Fold in the canned chiles. Add 1 cup of chicken broth to the skillet, stir. Pour the cooked turkey mixture in the crockpot over the beans. Add the remaining 2 cups of broth and cilantro to the crockpot. Fold everything in, from bottom of the crockpot up, to gently mix the turkey and beans together. Cover and heat for 4 hours.